The Kamden wall sconce features two ultra-clean, square acrylic shades are hand-polished then mounted in a die-cast metal frame. Powerful LEDs direct light through the glass in both directions. 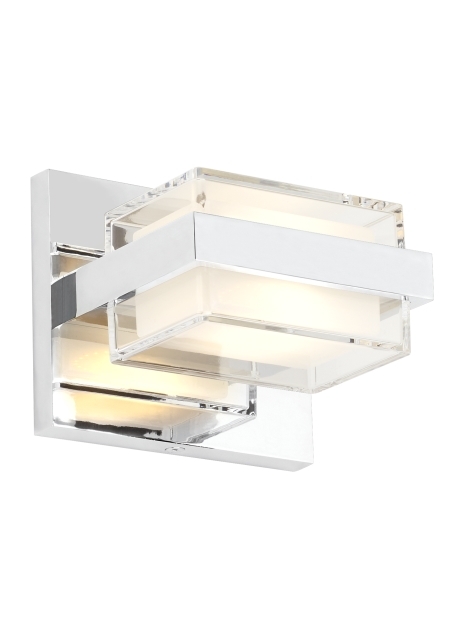 The light cubes are mounted to a carefully finished metal back plate and can be mounted vertically or horizontally making the Kamden wall ideal for hallway lighting, bathroom lighting and bedroom lighting. The Kamden is available in either a sleek Satin Nickel or Chrome finish, each finish further enhances its contemporary style. The Kamden wall sconce ships with energy efficient integrated LED lamps, all lamp options are fully dimmable to create the desired ambiance in your special space. Length -- Choose -- 1"